Cape Dorset is located in Nunavut on West Baffin Island with only 1300 inhabitants. Nevertheless, for over 50 years the city has one of Canada’s most productive art environments. In the city is the atelier Kinngait, which is the inuit name of Cape Dorset. The art of this exhibition comes from this workshop. Arctic animals and nature are the traditional motifs that characterize the art of Cape Dorset, but most often with a graphic expression; stylization, interpretation or a distortion. The motives are immediate and with color surfaces to accommodate the graphic technique, which creates both thoughtful distortions and romantic stylizations of the motifs. The studio in Cape Dorset was founded on an idea of ​​James Houston, an artist and Canadian government’s Northern Service Officer. In 1957 he and some Inuitian men began working on experimental presses, and on a trip to Japan Houston studied woodcut and was inspired by the process of translating an artist’s drawing for a professional printmaker. He brought this model back to Cape Dorset, but instead of carving in wood it was implemented in a local material and the carving in stone. Through the years other printing techniques were included – stencil, mono print, lithography etc. Each artwork from Cape Dorset has 2 artists behind it. An artist creates an original drawing. The studio selects which drawings are best suited for printing. A printer (the other artist) transfers the drawing to an appropriate printing technique. The graphic work was an art form which Houston thought lay in direct extension of the inuitian craftsmanship with the carving in bones, rocks and teeth as technique, as one could work in the artwork to a higher artistic level and sell outside Cape Dorset; not as tourist art or souvenirs, but targeted toward art world galleries. 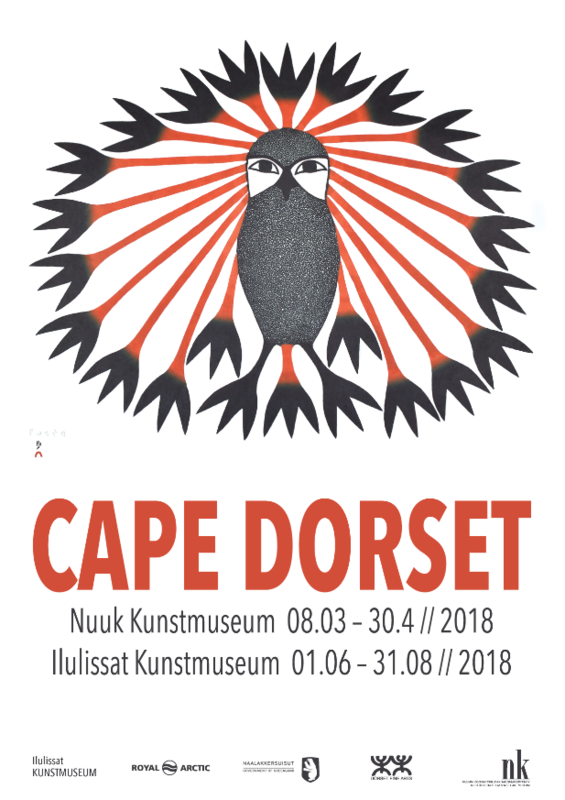 Same ides was used at the art school, Kunstskolen, in Nuuk, which was founded in 1975 called Grafisk Værksted (Graphic Workshop) with the graphic work as a turning point and with Cape Dorset as a model. In 1959, the printmaking studios, which today are atelier Kinngait, was established. Since 1959 a print collection has been published annually. In 1979 the studio received a marketing department and currently has galleries outside Cape Dorset.